We now live in a world of good wines - excellent wines in a great many cases. The bad old days (1950's, 1960's, in this case) of watery acidic plonk arriving in a straw-covered flask (appropriately, "fiasco" in Italian) are well and truly past. Almost all Tuscan DOC wines and DOCG wines produced in Tuscany, plus many IGT Tuscan wines, are good or very good. This means that when wine tasting in Tuscany, we can in effect expect the wine to be more than drinkable and therefore what we are searching for is a wine that suits our taste. That could be a wine similar to what we have always enjoyed, or something interesting and novel - this depends on the individual and often also on the occasion. • DOCG, DOC and IGT Tuscan wines - the areas and wine classification. • Chianti Classico wine region of Tuscany. • Introduction to the geography and main towns of the Chianti Classico area. • Chianti and Tuscany :: Grapes and Wines. • Italian wine grape varietals. 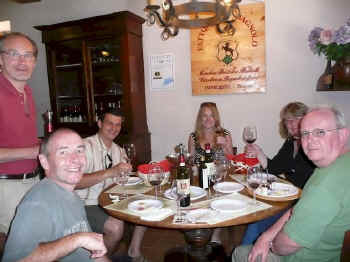 Back to Tuscany Wine Tours and Wine Tasting.